Unlike most guests we were arriving with an addition, a very big addition in the way of a 28ft rig called an Airstream. It was getting close to dark and the winding road from Dolores started to get thinner and less paved as we drove on; but the lovely young man on the other end of the phone reassuringly gave us directions, told us we would make it in time for dinner and kindly said they would wait for us. We followed the winding river further and further into nowhere until the scenery became like a backdrop to a movie. 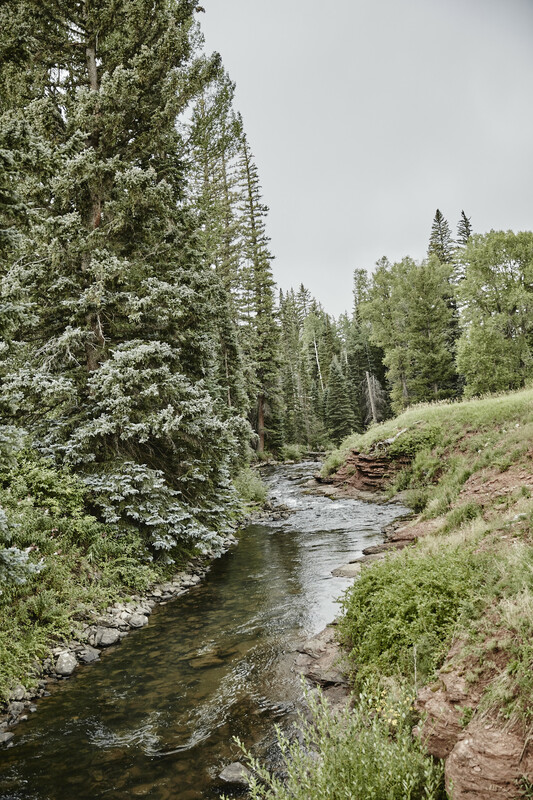 Majestic mountains covered in aspens, verdant pines and columbine trees surrounded valleys of the deepest green. Log cabins peeked out amongst the trees and a band of what seemed like wild horses meandered alongside the babbling shore. 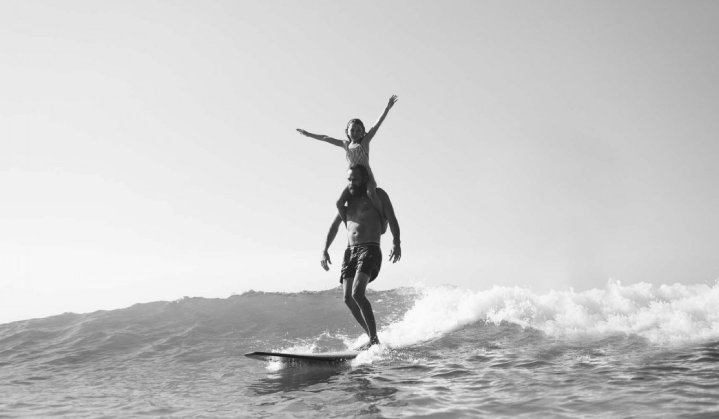 The air was deeper, fresher here. We felt it instantly and the smell was just as I imagined it might be, all woodsy and pine. The deeper we drove into the San Juan mountains, the quieter we became as it hit home we were actually here; in a place that had seemed a million miles away. A place we had only dreamt of visiting, perhaps, one day if we were lucky. 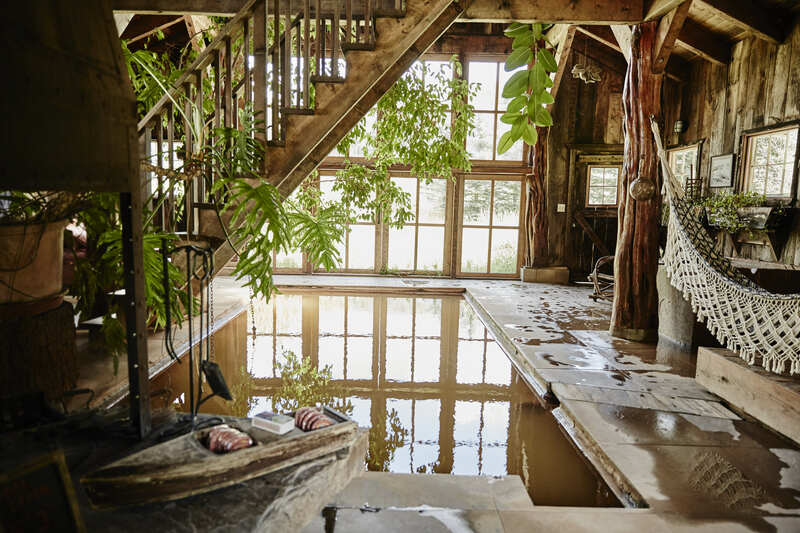 I had fallen in love with the images of Dunton Hot Springs through the screen of my computer on the Mr and Mrs Smith website many moons ago and now to actually be here, well it felt a little surreal. 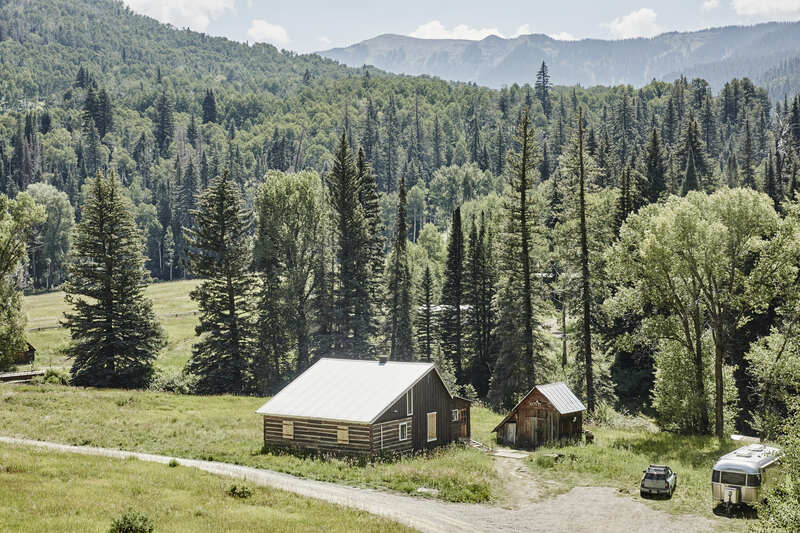 We ventured through the gate of the Dunton River Camp and rolled down towards what seemed to be a barn where we were met by a smiling woman in a golf cart who kindly told us where to park our home. With the patience of a saint she politely watched us gather our things, which were not neatly kept in suitcases but scattered throughout the car and airstream. After answering the billionth question from the children about who could sit in the front seat with her she politely informed us the other guests were having pre dinner drinks up at the farmhouse where she would take us directly while our luggage was taken to our tents. We came in from the direction of Santa Fe where we had been camping in Hyde Memorial state park. We had a solid two days of driving ahead of us but we were looking forward to it. As we drove out to Abiquiu and past the haunting vista that is Ghost Ranch, the dust that slowly turned our silver home red soon gave way to the dense deep green of Colorado. New Mexico was no more and it was another dramatic change in scenery that had us shaking our heads in wonderment. With a late night stopover in Durango at a local RV campsite (bears and all) we had plans to hit the road early but that wasn’t to be. The Airstream made us quite popular with the grey nomads and Sammy loved to talk model, year, dump stations, weight blah blah blah with his new friends at every opportunity; so after a slow morning (the park owner asked us to leave) and a few cups of tea we FINALLY hit the road for Dunton Hot Springs or should I say Dunton River Camp. 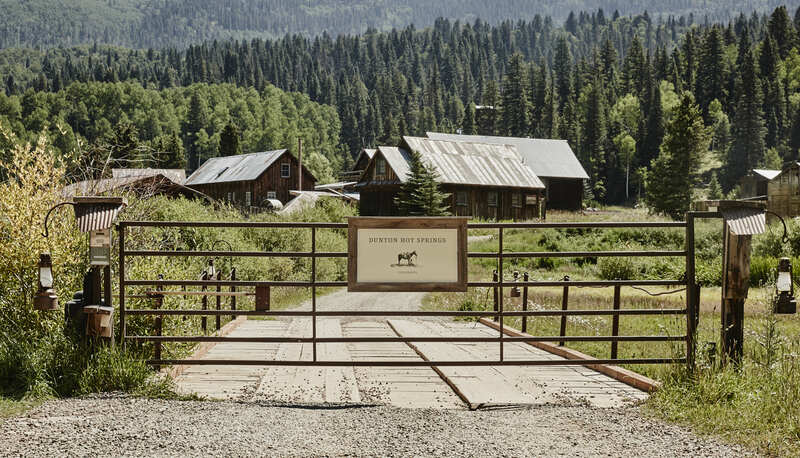 Dunton River Camp is actually the sister property to Dunton Hot Springs. It sits a few miles (or so) away and is an entirely different experience, which we were soon to learn firsthand. Drive | There are a number of directions and scenic drives to Dunton. The main thing here is to contact the staff so they can give you exact directions over the phone or via email. Don't rely on your iPhone or GPS as you will be off the grid soon enough. Fly | There are four airports that are central to the town of Dunton. Durango, Telluride, Cortez and Montrose have daily flights and private charters can be arranged. From here you can either have a member of the Dunton team pick you up or hire a car and drive yourself. 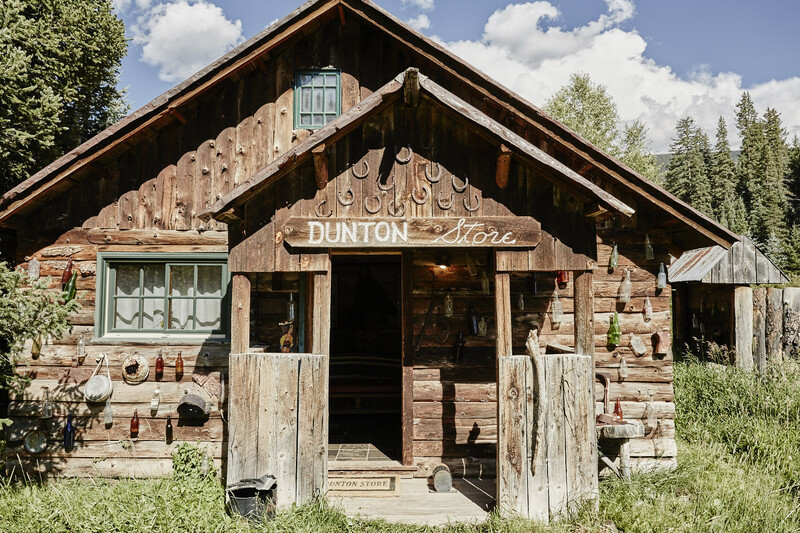 Both Dunton properties are based at the bottom of the San Juan Mountains, nestled deep in the Colorado Rockies. We were staying at Dunton River Camp, a former cattle ranch from the 1800's that lies across the mountain from Telluride. 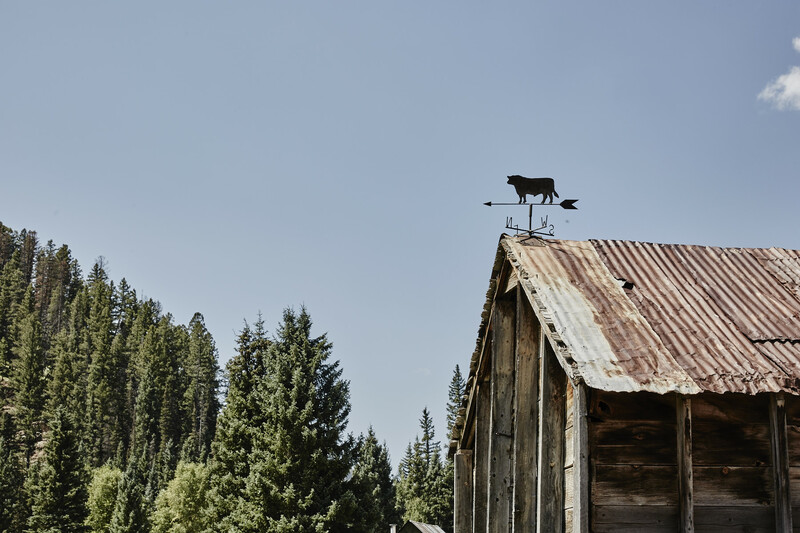 Now called Cresto Ranch it sprawls out across 500 acres of lush fields, meadows and forest some of which is still being used for grazing free range cattle. 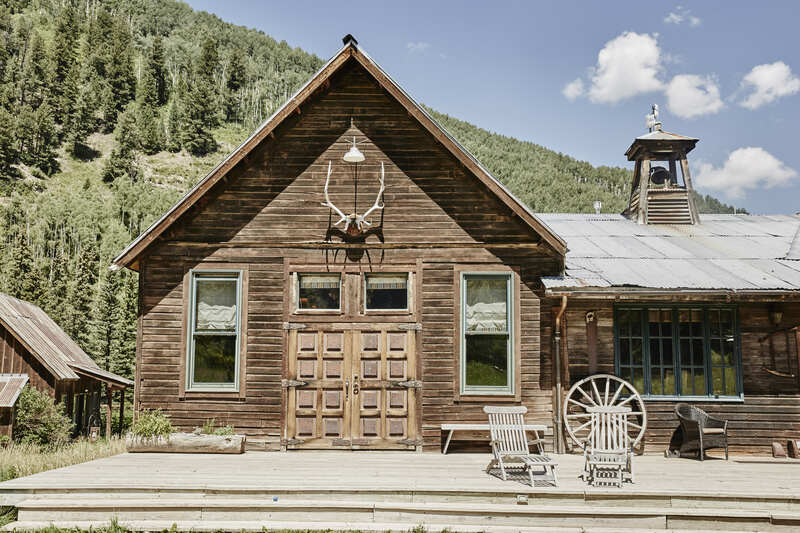 The heart of the property is the original farmhouse which sits in it's original spot some 20 feet from the West Fork of the Dolores River. It's here we start our days and end our evenings sharing a meal and drinking wine over adventure stories with the other guests. From the farmhouse you can either walk or ride your bike along the dirt track that meanders across the river to where the safari tents are perched amongst the trees or alongside the riverbed. At night lanterns throw soft light amongst the dark. Dunton, Colorado, was a small-unincorporated settlement in Dolores County, located about 12 miles northwest of Rico by road. 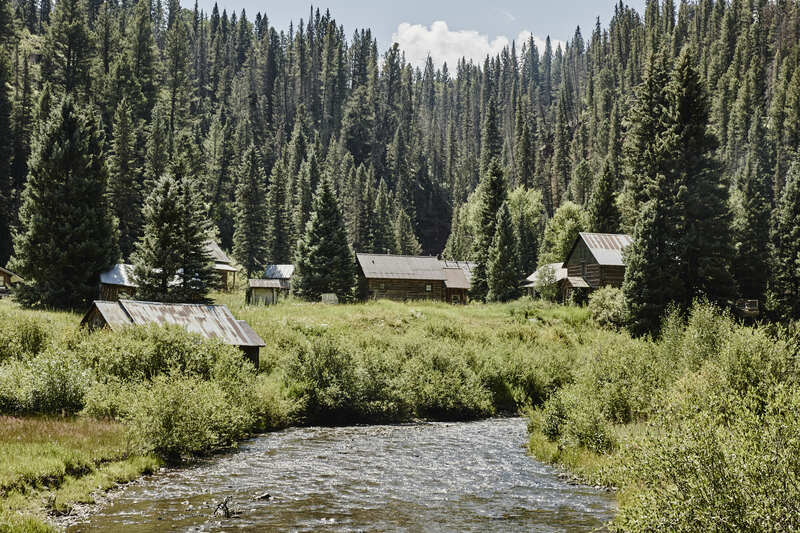 The town was established in 1885, and it consisted of log structures stretching for about a mile along the West Dolores River. Early-day Dunton was a mining camp, and the mines were located about half a mile down the stream from the community. Over time it became a ghost town, one which Butch Cassidy used as a hideout after robbing his first bank in nearby Telluride. 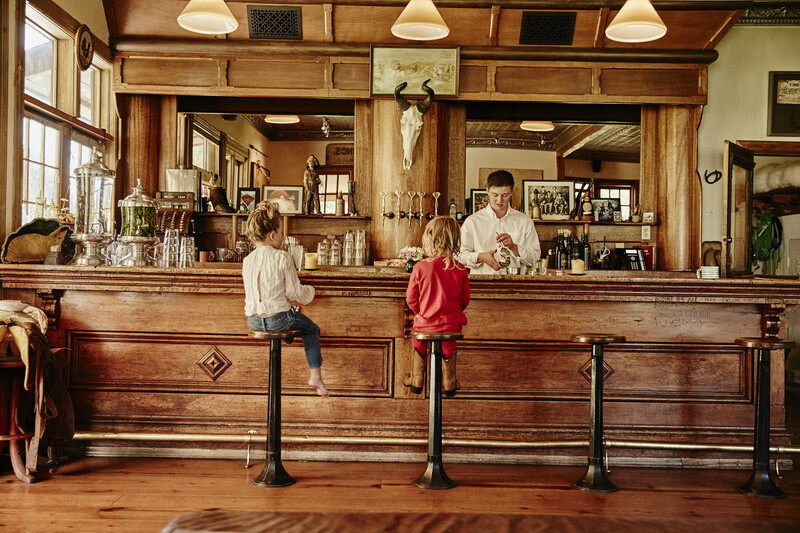 The original saloon which is the heart and soul of Dunton carries the carved initials of Butch Cassidy and his sidekick Sundance on the bar, attesting to the lawlessness that prevailed in this part of Colorado in the 1800’s. Cool. In true Dunton style there is nothing themed or contrived here. It is very understated and elegant in design. It's a mix you wouldn't really expect of the then and now. 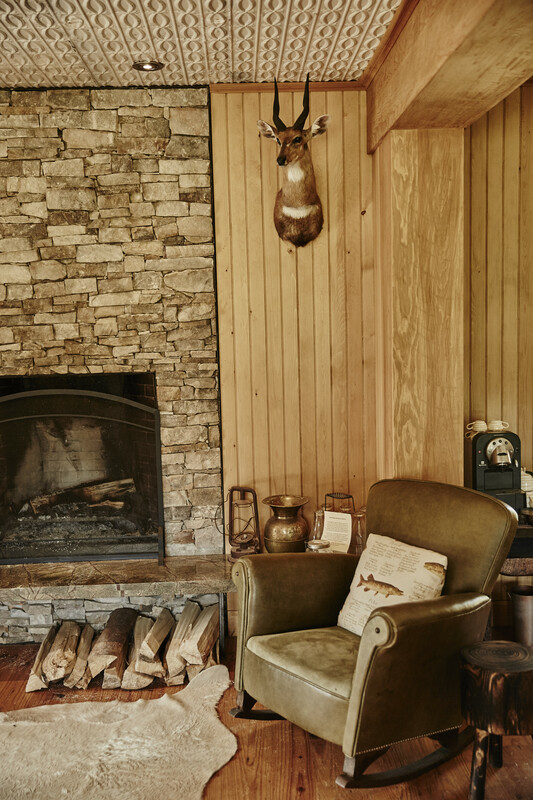 Prospector tents, fish skin lamps, recycled military couches, animal skins and antique treasures sit alongside a hand selection of modern art from the owner's private collection. Even though it’s classified as luxury it feels very earthy, very real. I feel that this is very much in play by having all the guest dining together in a communal space. This may not be for everyone but it really was one of the things we loved the most. Our journey really is all about the people we meet. 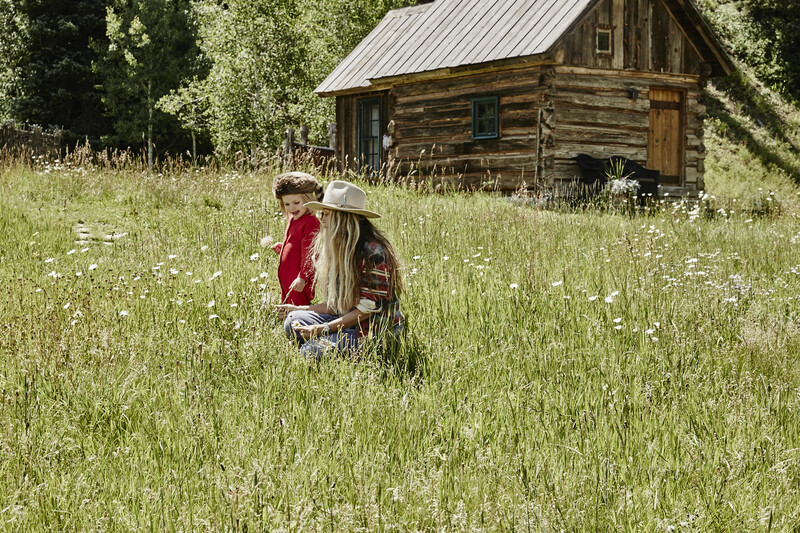 What we learn from them about their home, their culture and outlook on life. We may have been sitting down to eat but it was the conversation of those we met that really filled us up. A great place for kids. Exceptional. 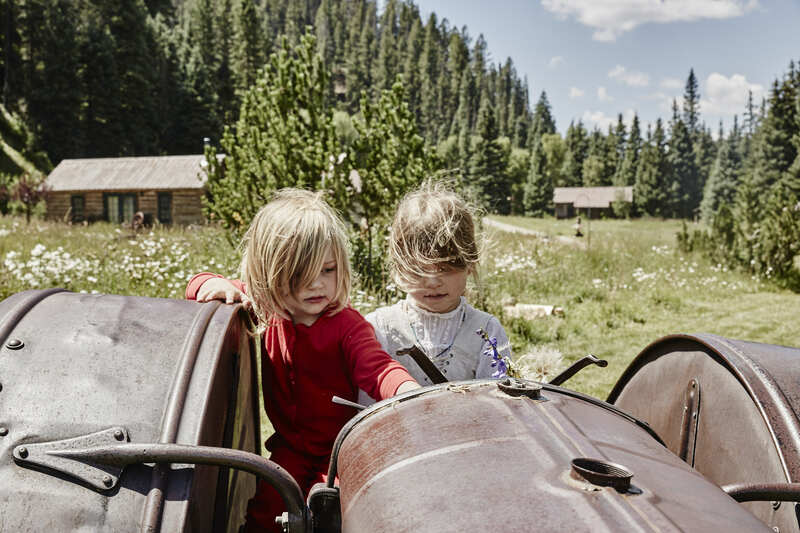 I would suggest if you have younger kids to stay at Dunton Hot Springs over the River Camp. 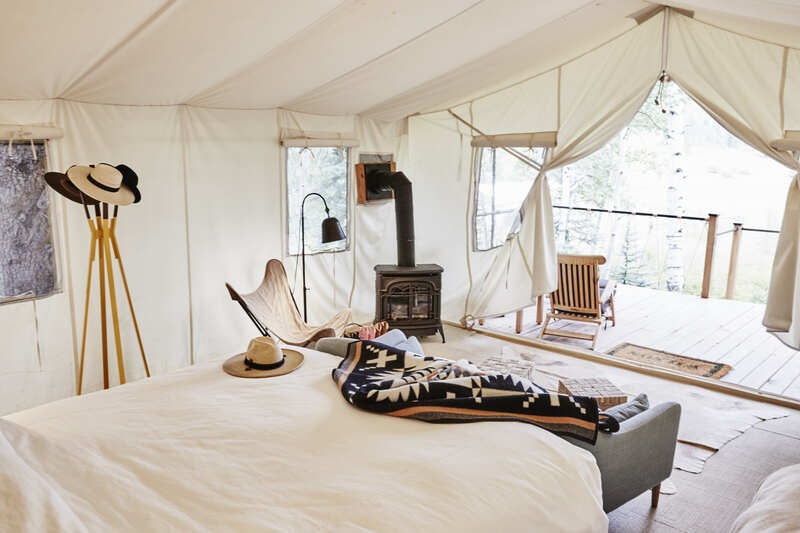 Even though we are more partial to the tents then the cabins for accommodation there are more general activities on hand for the tiny ones; namely the hot springs. I say this really just for convenience. You can stay at The River Camp and spend time at DHS but you have to drive a small distance. The kids loved spending time here and running around on the big open lawn playing with the old tractor and exploring. It's a great space that allows them freedom to explore while you enjoy some down time on the main deck perhaps over a delicious organic meal and glass of wine. Lawn games are set up as well as board games inside. If you have older kids (say eight and over) the River Camp is great and the perfect way to get some really quality time with your children. There are no phones, computers, televisions etc to waylay them. Just you and the great outdoors. Like Dunton itself, the staff are very low key and respectful of your privacy. At times it felt like we were there completely on our own which I loved. Again if you are more about being constantly waited on then this might not be for you. If you need anything they are there no doubt but overall they leave you to enjoy this incredible place as if it were your own. My favourite places to stay are those where they help you build your own itineries and Dunton is no exception. 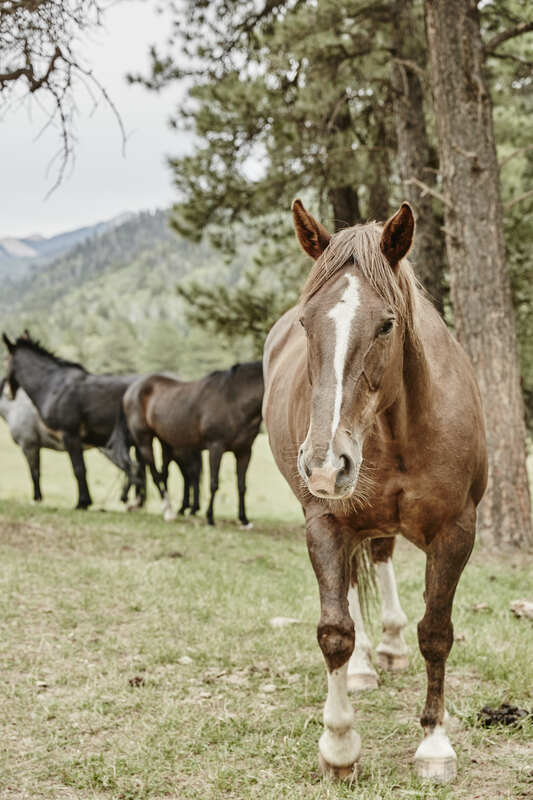 For example we wanted to take the children horse riding but Captain was too young for what they could offer; so instead the staff suggested we spend the morning with the Sous Chef high up in the San Juan National Forest foraging for mushrooms. 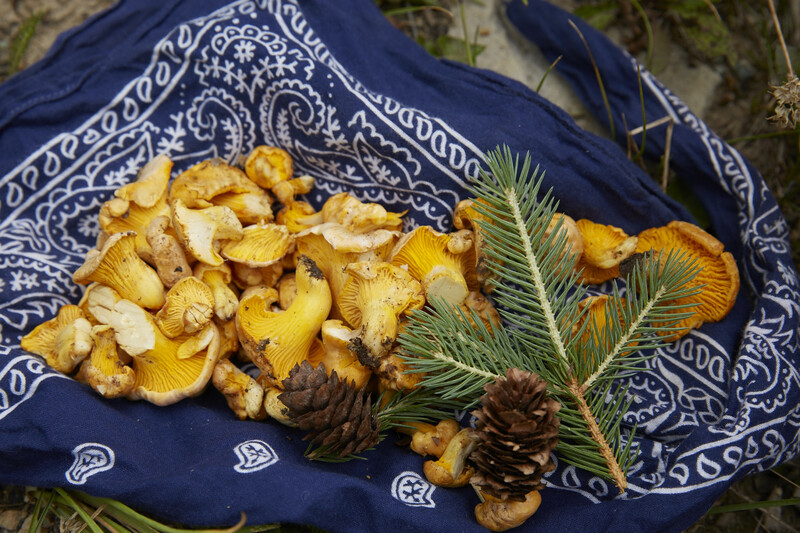 We learnt all about chanterelles, porcini and boletus mushrooms while listening out for wild animals. It was so awesome to be out in the wilderness like this learning about the trees and the animals. We finished the afternoon with a picnic in the woods where (and I still can't believe it) we saw a black bear, just hanging out. If the below is a little bit more activity then you had planned, then the spa tent perched high up on Cresto Meadow with views for days might be your bag. Over at DHS their yoga and pilates studio is available for private sessions. As mentioned previously communal dining is part of the experience here but at your request private dining can be arranged; BUT don't do it. You will meet some of the loveliest and most interesting people at the dining table. When we were there the Executive Vice President was onsite for the week and dined with the guests every evening. It was such a treat to learn first hand about the history of DHS and how it came to be what it is today. The guests that come and get married here return for anniversaries, then with their children. 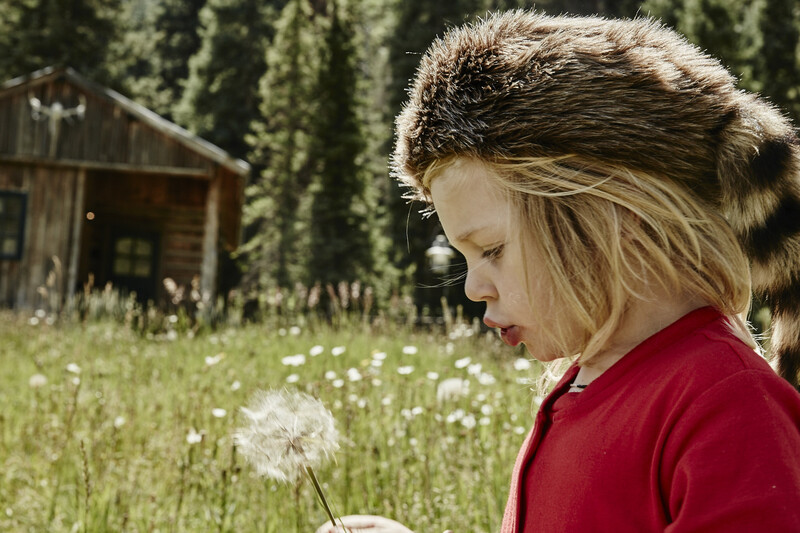 It’s here where you’ll learn about life in Colorado, and share adventure stories from the day. This personal connection will keep you coming back. Also the food doesn't hurt. Curated, served and collected with the utmost care the evening meal feels like you are eating art. 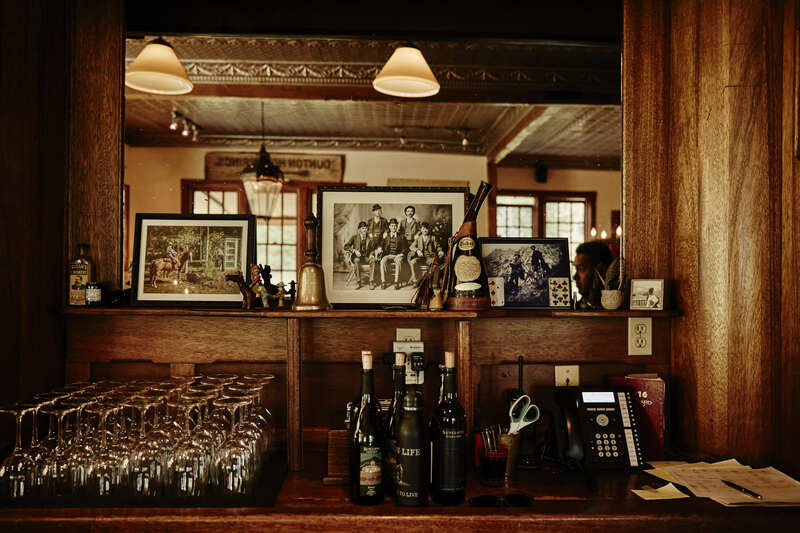 The chefs draw on classical training to create a new menu everyday using local and regional organic ingredients, some from their farm and vineyard. Only a meal such as this deserves a late supper of S'mores and hot chocolate (lets be honest, wine) under the stars by the fire. We were aiming for Wild West meets Out Of Africa. We landed on total impractical. In hindsight I would have gone very much more down the path of active wear by day and Ricky Lauren at her Colorado ranch by night. 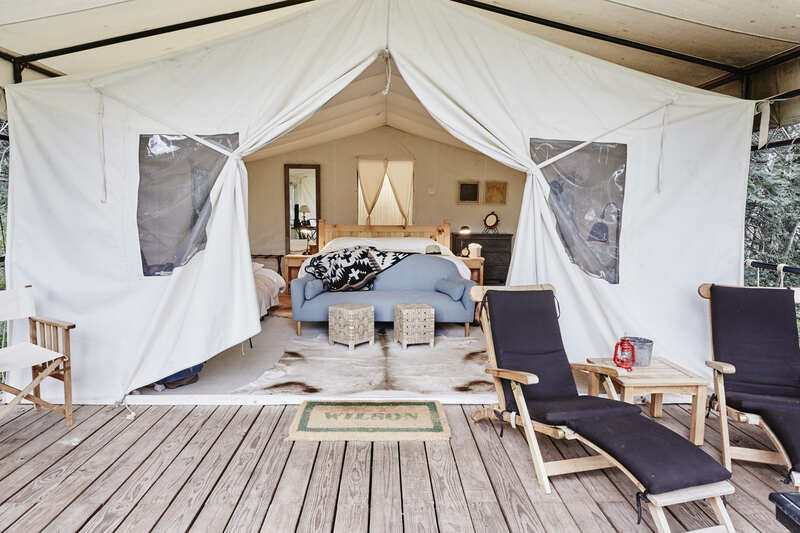 The ranch accommodates only eight tents so it feels incredibly private and intimate. Thoughtfully designed, the owners built discreetly placed tents amongst nature rather than capitalizing on their huge expanse of land with dwelling upon dwelling. The result? What you see sprawled out in front of you is indeed exactly what you came here to see. 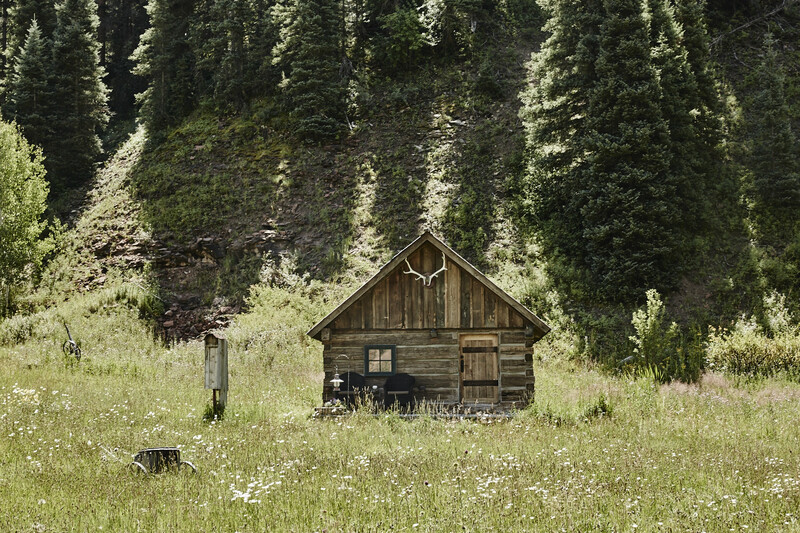 These prospector style tents are a tiny oasis amongst the great outdoors. Ours was one of four mountain tents nestled in the Aspen trees overlooking the jaw dropping views of the 14 thousand foot El Diente peak and the Wilson Range. 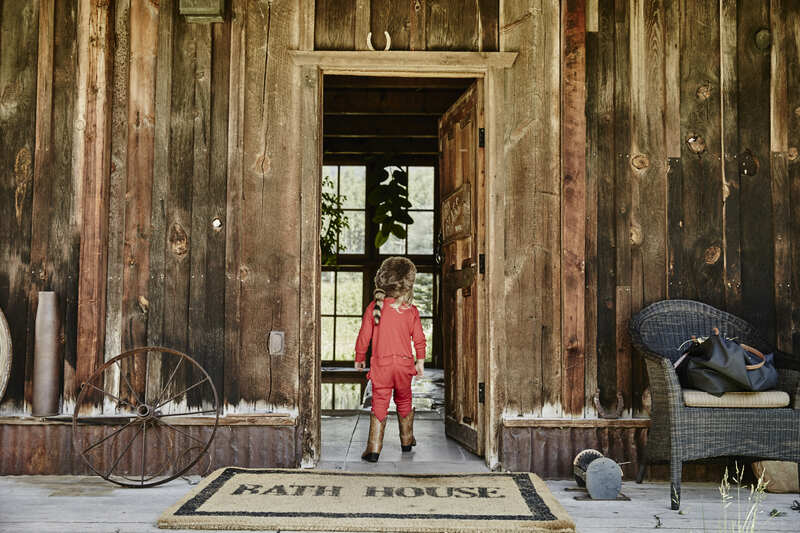 With our own six foot soaker tub, towel warmers and pot belly stove (on thermostat might I add) to keep us snug at night we all felt like little kids having a sleepover for the first time. Large enough to fit a family of four and then some, we added only one additional cot as most nights a warm little body could be found in the king size bed. Wi-Fi is on hand for those in need (guilty) but there isn't any phone reception, which is heaven. Hands down the ultimate tent experience to date. We love the inclusive rate structure at DHS which covers all food, beverages (sorry to keep talking about wine), laundry, bikes, sauna and certain activities. Check with the team when booking what is additional. Peace and quiet. Serenity. This place is truly time away from it all. No cell service but Wi-Fi optional I could hear myself think, breathe and be present. At one stage we were the only people at the camp and it felt spectacular. The scenery is a spiritual experience in itself. You will stand and stare, wonder and be grateful. It will reconnect you with the planet and remind you why we need to care. I would suggest a minimum three nights if you’re looking at a small investment. What’s great about Dunton is that you don't feel pressure or internal stress to get out there and accomplish all the activities on offer. It's not that kind of vibe. It feels justifiable spending your time simply being in the space. Three days you can accomplish both or either. For an event or holiday such as Christmas it would be wonderful to spend a week here with friends. 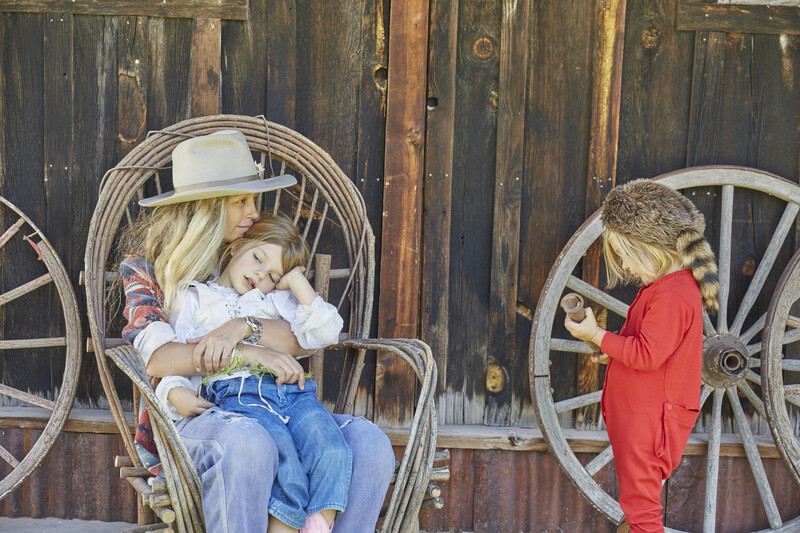 Active Wear | It may look all rustic and western romance but this is the serious outdoors. Were we prepared? Of course not but now you will be. Hiking, riding, fishing, mountain biking, foraging, yoga… Bring the lycra, the all weather wear and sunscreen. Cozy Wear | Temp wise it depends on the season but even in the summer the temp can drop in the evenings and the early mornings. 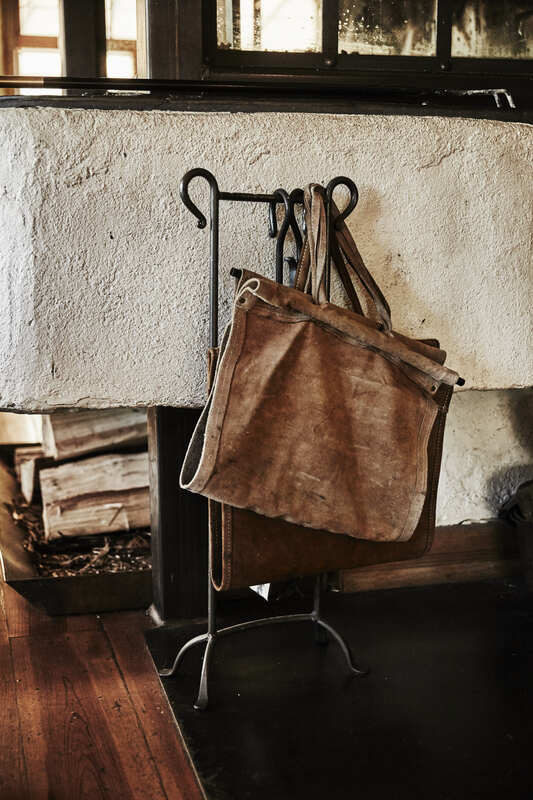 Time spent around the fire is mandatory so bring something cozy. No Wear | Don't be fooled by the snow. You will need swimmers all year round for the Hot Springs but word on the street is clothing is unofficially optional so there is one less thing you need to worry about. Make sure to check when booking your stay about activities that are age relevant for your children. There are age limits on some activities such as horse riding and fly-fishing so make alternate plans with the staff. Also be aware that additional activities are outside the inclusive rate. For bookings contact the expert team at Mr & Mrs Smith Hotels who specialise in unique luxury and boutique holiday experiences. They also work closely with locations that provide the very best of family travel. In short they really know their stuff. A visit here in winter would be spectacular. The River Camp is closed but Dunton Hot Springs looks like a winters fairyland. 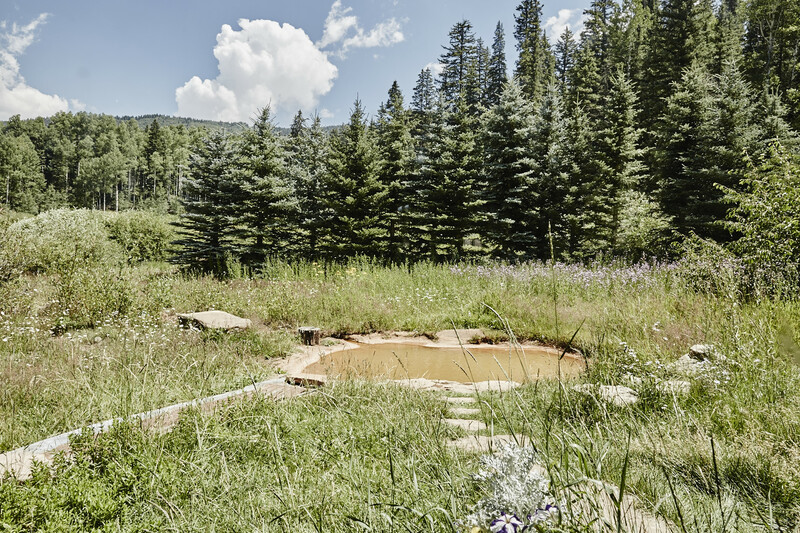 The hot springs in the snow… can you imagine? A big shoutout to the team at Dunton for being such great hosts. What a wonderful experience you gave our family, thank you.